The fact that Toyota (Scion) has reintroduced an affordable FR-Sports car (front engine, rear wheel drive) back into its product lineup is so exciting! Everyone has been talking about it, dreaming about it, and hypothesizing about it for quite some time now… but last week, I actually had the opportunity to get behind the wheel of the new 2013 Scion FR-S.
As a member of the automotive media and an AE86 owner, it’s no secret that I’ve been blessed with the opportunity to see the new FR-S up close on a couple different occasions, but this would be the very first time that I had any quality seat time with the car. Straights are for fast cars. Turns are for fast drivers. I had the exact same thought. 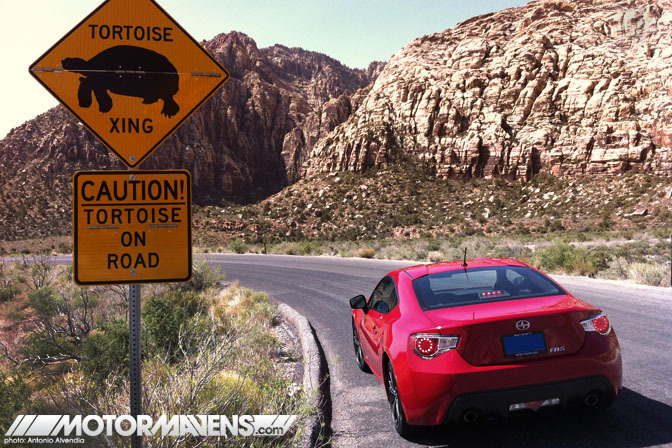 Can someone photoshop the turtle drifting on the sign? Post your 86 or see others in front of a(n) (in)famous landmark. What fits in your 86? Show us the "Junk In Your Trunk". 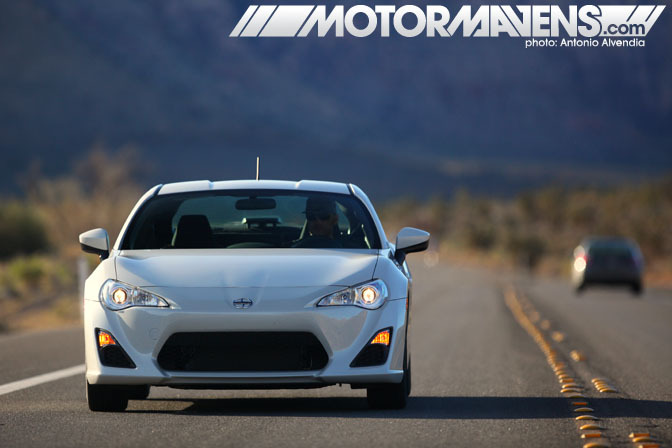 "Anyone who complains that the Scion FR-S doesn’t have enough power simply does not get it." Oh come on it's not that slow!!! Nothing decays like progress, and nothing preserves like neglect. I agree. The rear, in white, really does look like a storm troopers car! 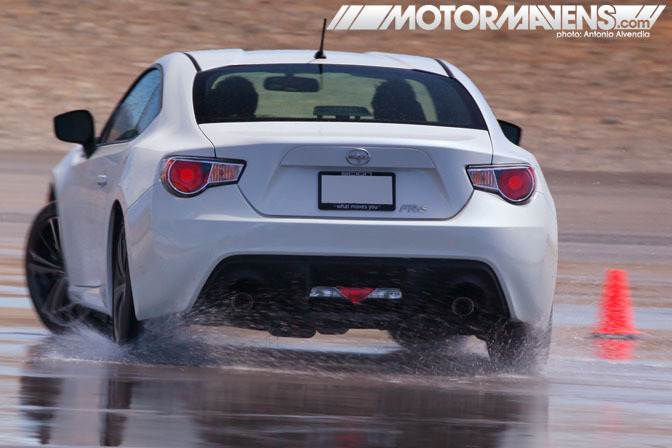 "The AC, fan and heater controls in the FR-S are very easy to use dials instead of more complicated pushbutton units found in other cars. I like that. However, what I like even more is the fact that there’s a little pocket underneath the AC controls, with just enough room for an iPhone and/or iPod. 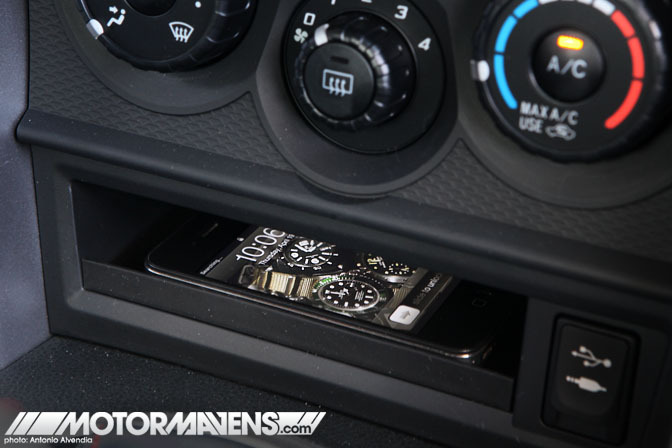 Even better than that is the small rubber lip that sits at the edge of the pocket, which prevents your iPhone from sliding out onto the floor in the middle of a spirited driving session. AWESOME." Agreed. I just wish it had a USB port inside the pocket. That way you could leave the cable plugged in but out of sight. I wonder if the unit has one on the back, might have to rig something up that way. Last edited by Dadhawk; 04-26-2012 at 04:16 PM. Agreed. I just wish it had a USB port inside the pocket. That way you could leave the cable plugged in but out of site. I wonder if the unit has one on the back, might have to rig something up that way. hey, either way it will work, right? the simplicity of this car is something I LOVE!! so many cars these days lean so incredibly heavily on electronics...this car is a slice of old school in very attractive contemporary packaging. i started to entertain the thought of looking at a used 11'-'12 Mustang GT 5.0...but not even that car is as simple and well packaged as the FR-S. a lot faster, but probably not as fun and certainly not as efficient. That's unexpected, that storage hole looked much smaller. No I agree, I just hate cables hanging everywhere.